With just an outside chance of making the play-offs, Simon Grayson shuffled his pack as Ross McCormack fired the only goal in a 1-0 win against Burnley. Grayson dropped Robert Snodgrass to the bench and started with a 4-4-2 formation with McCormack partnering Billy Paynter up front and Max Gradel and Bradley Johnson in wide positions. George McCartney came back in at left back with Eric Lichaj on the right. The central defensive partnership remained the same while Jake Livermore was dropped as Neil Kilkenny came back in to partner Jonny Howson in midfield. After Billy Paynter had fired narrowly wide and had a header denied magnificently by Brian Jensen and Kasper Schmeichel took one for the team, blocking Michael Duff’s shot with his face, Leeds took the lead. Bradley Johnson played a through ball to Ross McCormack who timed his run to perfection, ran through on goal and slotted past Jensen for his first goal for Leeds. He celebrated with a Leeds salute in front of the Kop. The Whites had spent the half looking remarkably assured, passing it well in midfield and coping well defensively. We held out to half time with the lead intact. The second half started reasonably and there was a fair amount of positivity amongst the 31000 inside Elland Road who were urging Leeds on to extend their lead. Billy Paynter could have gone someway to improving his image with the fans but, after heading straight at Jensen with one chance, he then rounded the ‘keeper only to hit the side netting. 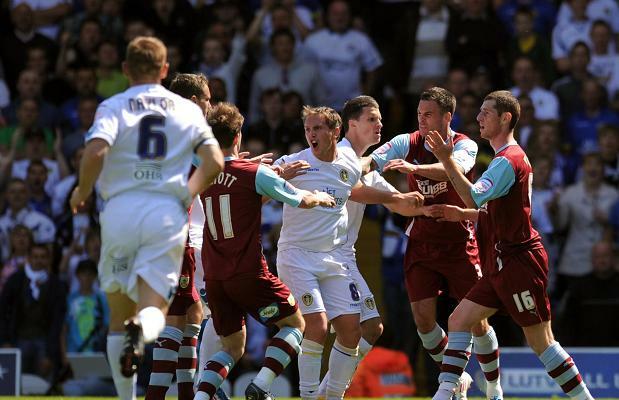 With Leeds dominating and Burnley struggling to get into the game it started to get feisty. Three high challenges in a matter of seconds ended with Gradel being kung-fu kicked at head height. A brawl broke out which somehow ended in two Leeds players, Kilkenny and Lichaj, being booked while only the original offender, McCann, was booked for Burnley when there may have been a case for a red card. Looking back at it, the only thing that Kilkenny and Lichaj did that the other fifteen or so players involved didn’t was get there first. Either way, it set Leeds up with a free-kick in a wide position. Following the free-kick Leeds had an extended spell of pressure with a number of chances. Andy O’Brien connected well with a header from the initial free-kick but it was straight at Jensen, while not long after the ‘keeper was called on again, getting down to his bottom corner brilliantly to tip a deflected Ross McCormack shot round the post. As the half wore on, Burnley were pressing us further back and for a while our passing game deserted us as we reverted to long balls to relieve some of the pressure. We were defending well and restricting the visitors to long efforts but they did come close on a couple of occasions. Youngster Jack Cork fired a 30 yard effort just wide of the top corner and then Schmeichel was forced to save acrobatically from a free-kick. Simon Grayson made two late substitutions bringing Sanchez Watt on for Max Gradel and then, in the dying minutes, Leigh Bromby on for Ross McCormack to see the game out. Both departing players received deserved standing ovations. Watt could have wrapped up the win but, after good footwork around the area, fired over with one chance and then wide with another. Overall it was a well-deserved win but it should have been by a greater margin. It was a really good performance, both defensively and going forward and it shows that there may be hope for the future of 4-4-2 at Leeds United. It’s hard to pick out outstanding individuals from such a great team performance but Ross McCormack was impressive throughout, taking his goal well and working hard for the team while we saw yet more of the same high standard from Max Gradel. Kilkenny was a welcome addition to the midfield and performed very well while Aston Villa loan man, Eric Lichaj, continues to look solid and tireless in defence. Despite the win there remains only the slimmest mathematical chance of clinching sixth place and it would require Leeds beating QPR and Nottingham Forest losing with a six goal swing. It’s looking extremely unlikely, leaving a bittersweet taste at the end of a good match. There’s also some sadness at the fact that this may have been the last time we see many of today’s side playing at Elland Road with loan players, Kilkenny and Johnson looking likely to depart and rumours of a cash-in on Schmeichel. Let’s just hope we can build a team that can push us just that little bit further next season.